Double camshaft malossi power cam nine. For Yamaha t-max 500 from 2001 to 2011. The camshaft is the most important part of the 4-stroke engine at the distribution level. The camshafts are responsible for the management of the opening and closing of the admission valves for the supply of the combustion chamber and the opening and closing of the exhaust valves for the combustion chamber. Malossi dual power cams have been developed to achieve an optimal and progressive power increase if they are mounted to the original cylinder or exponential if they are mounted on the malossi 560cc twin cylinder. Malossi has thought of both carbureted vehicles and injection vehicles: each model, first or second series, can boast, indeed, of a significant power gain if they are mounted with double power cam malossi. The dual power cam malossi are the result of a long and meticulous project. New, sold in original packaging. In stock - shipping within 24 hours. 500 4t lc 2001-> 2003. Yamaha t max 500 ie 4t lc 2004-> 2007 only for cylinders malossi ø 70 or pair of malossi pistons ø 66 for original cylinder (3413706). Yamaha t max 500 ie 4t lc 2008-> 2011 only for cylinders malossi ø 70 or pair of malossi pistons ø 66 for original cylinder (3413706). Camshaft controlling the exhaust valves. Camshaft controlling the intake valves. Superlinked steel, case hardened, hardened, nitrided and rectified with lobes recalculated, increased and reprofiled. 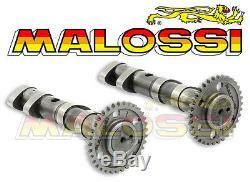 The item "camshaft kit malossi new yamaha tmax 500 t-max power cam 5913783" is on sale since Wednesday, January 15, 2014. It is in the category "auto, motorcycle parts, accessories \ motorcycle \ parts \ other ". The seller is "motodak" and is located in st quentin.